The 66th annual Experimental Aircraft Association fly-in convention in Oshkosh, Wisconsin, July 23-29, is the world's largest fly-in, with more than 10,000 airplanes attending. Among this year's highlights is the construction of an airplane in one week, as well as flying exhibitions and ground displays that encompass the entire spectrum of flight. Wittman Regional Airport in Oshkosh, Wisconsin, becomes the world's busiest airport for one week each year during EAA AirVenture Oshkosh. AirVenture is all about community, and this collective (One Week Wonder) project captures that theme perfectly. AirVenture will also celebrate the 100th anniversary of the Royal Air Force. Known for its heroism in the Battle of Britain, the RAF will feature an array of World War I and World War II aircraft, early fighter jets, and modern RAF aircraft on display in Boeing Plaza and in the air during the shows. EAA’s Theatre in the Woods will also feature programming on Monday, July 23, while an additional centennial event is planned for Tuesday, July 24. On Wednesday, July 25, the grounds will host WomenVenture, a national initiative to close the gender gap in aviation. Highlights will include a “Power Lunch” with remarks by director of Air Force Aviation Training Systems for Lockheed Martin, Heather Penney, as well as the annual WomenVenture photo featuring more than 1,000 women aviators in Boeing Plaza. In honor of its 70th anniversary, the Air Force Reserve Command will bring its impressive fleet of military refueling aircraft as part of AirVenture’s “Year of the Tanker.” Other major performances and experiences include Oracle pilot Sean D. Tucker’s final performance flights; the F-16 Viper Demonstration Team; an expanded Twilight Flight Fest show; and a variety of plane and aviation product introductions from the more than 800 exhibitors. AirVenture also includes learning centers for children and aircraft enthusiasts; aircraft of nearly every size, shape and era to view (including more than 300 warbirds, homebuilts and vintage craft); nightly activities, like a “fly-in” theater and concerts; and flight experiences on a B-17, Ford Tri-Motor and Bell 47 Helicopter. The EAA Aviation Museum is also open for tours during the week of AirVenture. 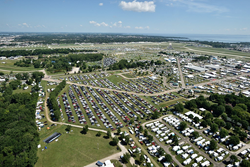 EAA AirVenture Oshkosh is the “World’s Greatest Aviation Celebration” and EAA’s yearly membership convention. Additional EAA AirVenture information, including advance ticket and camping purchases, is available online at http://www.eaa.org/airventure. EAA members receive lowest prices on admission rates. For more information on EAA and its programs, call 1-800-JOIN-EAA (1-800-564-6322) or visit http://www.eaa.org. Immediate news is available at http://www.twitter.com/EAA.